It’s not an illness if I can’t see it. Want to know what Universal Credit is like? Read this. Dear readers, as you know I’ve been blogging for a few years now, maybe more than that but I’ve lost count. Days merge into months and quickly into years. I’m betting that most of you can relate to this. Today has been extremely busy both outside the Jobcentre and the phone hasn’t stopped ringing and emails have been pouring in. People want to know what Universal Credit is really like, and also want to speak to people on Universal Credit. The reason for this is that the DWP has been taken to court via a test case and have been found guilty by the high court of acting unlawfully by denying claimants a lifetime top up for severe disability. This is a fantastic achievement, however they are appealing this decision so watch this space. Many of the people that I speak to weekly were previously awarded a lifetime top up but are now denied this. Thank you so much to everyone involved with this court case, its a landmark win and was vitally needed. So for those reading this and wanting to know what life on Universal Credit is like, I can tell you before you read the report from today. It’s awful, dire, stressful, it controls your life and takes away any freedom that a person previously had. It’s discriminatory, doesn’t take illness and disability seriously and seriously holds a grudge against people with disabilities and single parents. Basically its become a tool to harass and hurt the poor. I don’t say this lightly, I speak from experience. No real guidance is given and it’s much like being thrown into the lions den, people are scared and quite rightly so. The DWP basically hold them to ransom under the promise of a payment. Break the rules accidentally etc and they stop their payments which are a lifeline to them. Fail a farcical ESA and PIP medical and you are left with nothing, trying to scramble for help. It’s vile. The first person that I spoke to this morning had failed her ESA medical. She’s disabled and is struggling to cope. She is appealing this decision and is waiting for an appointment to do so, but in the meantime she has no food and no gas and electricity. Not liking crowds she can’t just walk into places where she doesn’t feel certain of but thankfully felt confident enough to speak to me. I helped her, gave her a food parcel and sorted out her gas and electric. What sort of a world do we live in where disabled people are left to starve, literally. I spoke very briefly to an Eastern European gentleman who looked stressed and busy. He didnt say much but he didnt need to, his face said it all. For those of the persuasion that believe that immigrants are ‘well off’ and ‘get everything’, you couldn’t be further from the truth. Come and spend some time with us and you’ll soon see this. 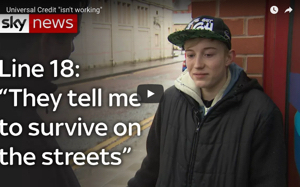 We spoke to a man who was leaving the Jobcentre. He looked in pain and he was wearing a very large, full back brace. I asked him if he was ok, and he told me that he wans’t. He had broken his vertebrae in three places and had also shattered his wrist in an accident. The DWP hadn’t told him that he can and should be claiming the disability element of Univeral Credit, and that they should in theory be going ‘easier’ on him. Of course readers will know that theory is very different from reality isn’t it. We gave him some valuable advice, handed him a survival guide and wished him well. I spoke to a man woman who is on Universal Credit. She has to pay back repayments for her loans that she took out whilst waiting for her Universal Credit to be processed. They have informed her that they are going to have to pay back 200 a month. Thats a very excessive amount, and she has asked them to lower the payments. So far they are refusing so I’ve referred her to further help. My local MP’s office will be very busy this week. She also needed a food parcel because she can’t afford to buy food. I spoke to a young woman who had been refused a fitnote by her doctor, the same Doctors surgery that the person that I mentioned in the blog last week. i’ve Informed them of what to do to obtain a fitnote, but will also be taking further action against this myself and involving my local MP. This young woman can’t work, she relies on strong medication and gets extremely drowsy. She has several disabilities, all of which are recognised.Her doctor told her that she can ‘find a job that’s suitable’. Yep, right, course she can. No person with a disability should be discriminated against like this, especially by a doctor. I spent some time reminiscing with a man, remembering the good old times when things used to be better. We both longed for a return of those days. We advised a lady to send a letter to the DWP via the post office and to obtain a receipt. It’s vital that you always get proof of postage at all times, because letters are always mysteriously lost. I spoke to a woman that had spent yesterday and today being messed around by different DWP departments. all she wanted was a fax to be sent from one department to another, but of course they can’t do this quickly and efficiently. I spoke to a lady that I havent seen in a long while. She had previously gone through aa spate of malicious sanctioning by the DWP. She had won her cases, but it’’s started again. Armed with previous knowledge shes fighting again. She’ll win, but in the meantime shes pregnant, with children and no money. Her mum is now having to help her out again, and she has little herself. I spoke to a young woman that appeared to be upset. She suffers from a disability but it isn’t visible. Her advisor is having none of it and had told her ‘if they can’t see it then it’s not an illness’. Now we know thats downright discrimination and with advice shes taking this further. It will take a lot of strength for her to do so though. The DWP can sometimes say what they want, not all are like this but many are, answerable only to the government that condones such incidences we haven’t got much hope have we. 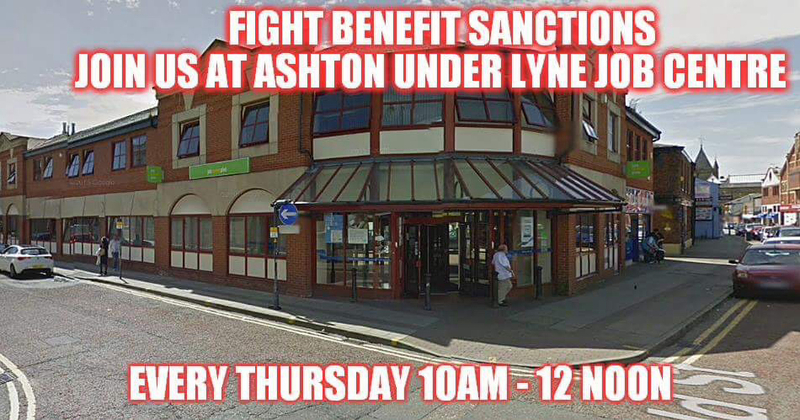 Thanks to the three nice advisors that are currently working at Ashton Jobcentre, it’s a pity that not all are like you. So here it is folks, this all happened in less than two hours. Food parcels were handed out, advice given and solidarity. I wish that I could do more but I don’t have the means to. Once again I’m going to say that we need some kind of support from a left wing polictical party officially, we need it. It’s hard work, the people I speak to are desperate but there’s never been a greater need. Many thanks to everyone that helped out today, you are all amazing. My apologies to my local MPS office because I’ve referred a few people over, but I shouldnt have to in the first place. We also had a minutes silence for all the Grenfell victims, their families and the community. I hope that one day they get the justice that they deserve. As for myself, I’ll just keep plodding on like I do. I do my best, I can’t be everywhere and I live on a very low budget so please be patient. Please read, share, talk about, email and tweet my blog. There’s donate buttons for anyone wanting to donate to keep it going. Thank you. Should women be encouraged to make ‘more effort’, or should the media leave women alone? Vulnerable man constantly sanctioned, when will this Universal Credit hell end? The person who said that (“it’s not an illness…”) needs reporting. That is just out of order and discriminatory. I had a similar experience years ago on the Work Programme, the Work Coach wanted me to apply for some telephone sales crap, but I said it’s not suitable as I don’t like using phones. She said “why not? you’ve got a brain, a mouth, two hands, you can speak can’t you? so why can’t you use a phone?” I had already informed them that I suffer from Anxiety (as part of having Borderline Personality Disorder, and told them I was on medication and seeing a Doctor) and I told her phones make me anxious. But she shouldn’t have put me in the position of having to explain all that as they had already been informed. it’s downright rude and unprofessional. You have my sympathy been told to apply for unsuitable jobs. A JCP Muppet did the same to me he wanted me to apply for an HGV driving job, all I had was a license for a car. I ripped it up in front of him, his face beamed as I threw the pieces on the desk, but he quickly knew he had a fight on his hands. Furiously signalling for the chocolate fireguard (security) who didn’t come anywhere near as I said he valued his life more than his job. I had already backed him into a corner on a previous occasion, he wouldn’t come near if he knew it was me. I was told to apply for a job in a shoe shop. without triggering a back spasm. The more I do these things, the more likely I am to spasm. Back spasms: like one of those awful nighttime calf cramps, but in ~1/2 my left lower back and my left buttock, hip, and thigh. I get 0-5 per week depending on what I do, they last anywhere from 5 minutes to 9 days, my mobility ranges from can-slowly-walk-10m to can’t-stand-without-help, the pain ranges from 6/10 to 9.5/10, and I’m mostly stuck lying on my back on a heatpack, wearing a TENS machine, and drugged to the eyeballs on tramadol, benzos, and sometimes morphine until it stops. I’d told the job coach this, too, and then had a moderate spasm in front of him while signing on a few weeks before.